Japanese street food! That’s what Yakisoba screams in my ear whenever I make it. Yakisoba is super nostalgic to me because, as a kid wandering around Japantown, I’d come across carts with griddle tops frying up Yakisoba right in front of me. This is literally an image in my head that I constantly relive, and it must have been sometime during the traditional Cherry Blossom Festivals held every year in San Francisco. I swear it was the best Yakisoba I’d ever had in my life…well, usually the first bite always is. Yakisoba is very much like Chinese chow mein, only the soy sauce base is a little more acidic and sweet. 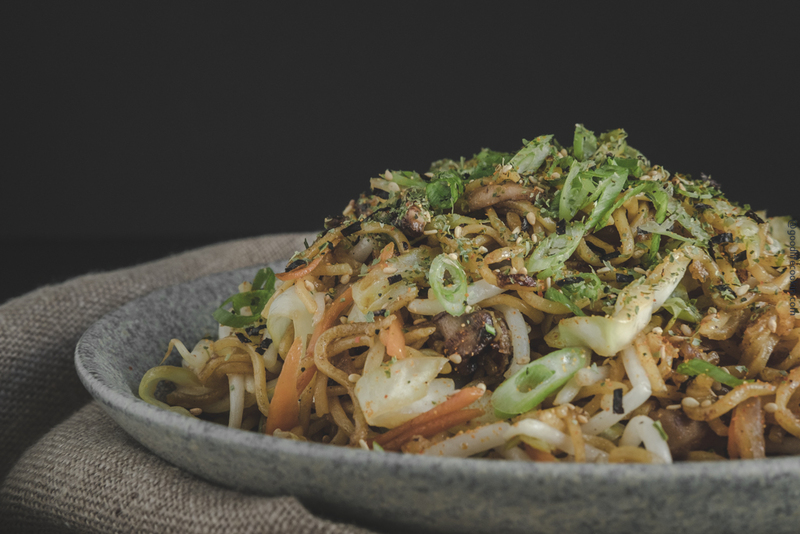 I love Yakisoba sauce because it’s very easy to use and coats the noodles with mad flavor. While you can make a sauce from scratch, I just prefer to buy the Otafuku brand pre-made stuff. I’m certain that they just use this pre-made sauce by the gallons in Japan too. As for the ingredients, if you’ve followed my blog, you know I just love shiitake mushrooms, so we’ll use that with the traditional cabbage and julienned carrots. I chose to use my wok, mimicking the thin griddle top of street food carts, to fry up the noodles, but if you don’t want to deal with noodles sticking to the pan, I’d suggest using a non-stick frying pan. To start, we’ll just start sautéing the mushrooms and onions in some oil to flavor everything up. Once we get some nice color on the mushrooms, we’ll go ahead and throw in the carrots, then cabbage, saving the bean sprouts for the very last ingredient. As we start to sauté the vegetables, we’ll look for a nice char on them, and throw down just a touch of soy sauce to flavor them up. We don’t really have to cook them completely through, as we’ll also be tossing these with the noodles later. For the noodles, I use a vegan brand of noodles that very closely mirrors ramen noodles. You can check them out in my last post here. We’ll get a pot of boiling water going and cook the noodles for just a couple of minutes so they’re nice and al dente. After you’ve strained them, you’ll then heat up your wok or non stick pan with a couple of tablespoons of cooking oil and throw down the noodles. I like to give my noodles a nice sear on each side for firm texture, then start tossing in the Yakisoba sauce to mix and coat the noodles. Once you have finished cooking the sauce into the noodles, you’ll just dump all the veggies that we did earlier into the wok. Mix to evenly distribute all the toppings and add a final layer of Yakisoba suace to insure everything gets covered. Finally, the bean sprouts! Bean sprouts are super good when they are crisp and refreshing, so I like to throw this in last, and give the Yakisoba a final toss in the wok. After about a minute of stirring everything around, you’re ready to plate! How easy was that? I feel like the hardest part about Yakisoba is preparing all the ingredients. Mixing everything is the easy part! An authentic Japanese noodle dish commonly made on street cart stands in Japan. Prepare all vegetables by rinsing and patting dry with paper towel. Slice cabbage and shiitake mushrooms. Julienne carrots and thinly slice 1/4 of an onion. Peel and smash garlic cloves to prepare for wok. Prepare a pot of boiling water for cooking noodles. In wok or non-stick pan, heat 1 tbsp of cooking oil over high heat. Cook onions and garlic with shiitake mushrooms until nicely browned. About 2 minutes. Add in carrots and cook again for 1 minute. Finally, add cabbage with 1 tbsp of water to aid in cooking process and help prevent burning. Cook for another 2 minutes to complete veggies then set aside in medium sized bowl. Cook noodles for 2 minutes or until al dente. Drain pasta and prepare for pan frying. Heat wok over medium heat and add 2 tbsp of cooking oil. Add cooked noodles and let pan sear for 1 minute on each side. Noodles may stick if using a wok and it's easiest to scrape the noodles up when tossing. Add in 3 tbsp of Yakisoba sauce and mix noodles to evenly coat. Cook noodles with sauce for 2 minutes. Add cooked vegetables and mix everything together with 1 additional tbsp of Yakisoba sauce for final coat. For plating, top with a generous amount of Furikake seasoning and sliced green onion for garnish. This sounds very delicious, some of the ingredients can be challenging for me to find especially the furkake but I think I can easily make it from scratch. Thanks so much for the comments. I’d love to hear how this dish turned out for you. Hope you enjoy! Wow, it looks so yummy. Can’t wait to try it . I am a newbie to plant based lifestyle and appreciate the support of fellow like minded people. Turning more and more towards Asian recipes and grateful for this suggestion. Awesome! Glad you can enjoy this recipe. please let me know how it works out for you. Id be happy to help answer any questions you have about the Vegan world too!